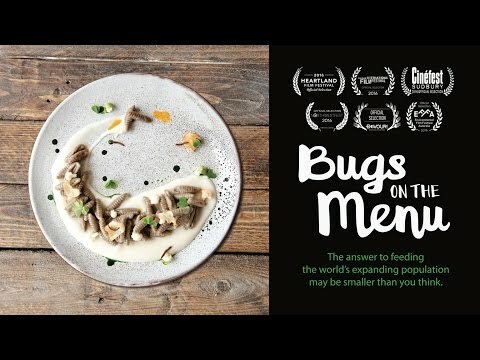 The feature-length sustainable food documentary "Bugs on the Menu" was shot in four continents over two years. It is a comprehensive examination of entomophagy (aka: ‘bug eating’), from the perspectives of cultural traditions in Latin America, Africa, and South East Asia. Experts Dr. Arnold van Huis of The Netherlands (author of the UN report "Edible Insects”) and Washington D.C.’s Sonny Ramaswamy of the USDA provide scientific analysis of this food industry revolution. It also follows startup companies, such as Ontario’s Entomo Farms, Salt Lake City’s Shark Tank-winning Chapul, Boston’s female-led insect chip company Six Foods, Austin’s Hult Prize-winning Aspire Food Group, Vancouver’s famed Indian restaurant Vij’s, and Seattle’s celebrity cook, The Bug Chef. These and other restaurateurs, cricket farmers, scholars, and scientists are part of a movement to normalize insect eating in the west, as an alternative to accepted, but resource intensive proteins like chicken, pork, and beef. From the perspective of the current state of the protein production system, this film clearly describes the advantages in terms of sustainability, health, profitability and scalability of insect food. "Bugs on the Menu" however, remains rather superficial on the issues of Food waste, health risks, relationship to the animal and much else. From a sustainability perspective, is a rather uncritical portrait or marketing film, focussing largely on the market and scalability of such a diet without real concern for insects as living entities in their own rights. A strange scene unfolds as a company representative explains the use of powdered insects as fertilizer for tomatoes.